Please view the Calendar section to find the timetables for the Leaving and Junior Certificate Examinations. 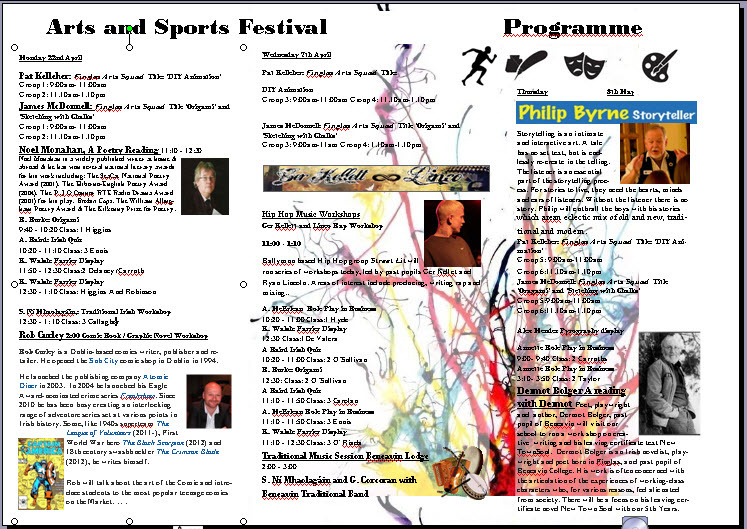 We have a most exciting line up for our 2nd Arts and Sports Festival which was launched last year by President Michael D. Higgins. 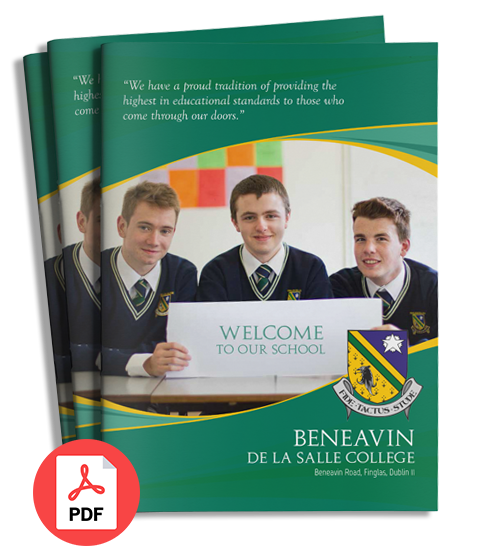 In Beneavin College we aim to provide an academic education in the context of an enriched education with as many opportunities as possible for all students to experience the Arts and Sports. Thanks to everyone for making last week a wonderful experience for the students. 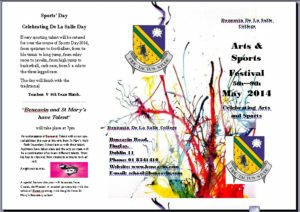 The Arts and Sports festival was a tremendous success. 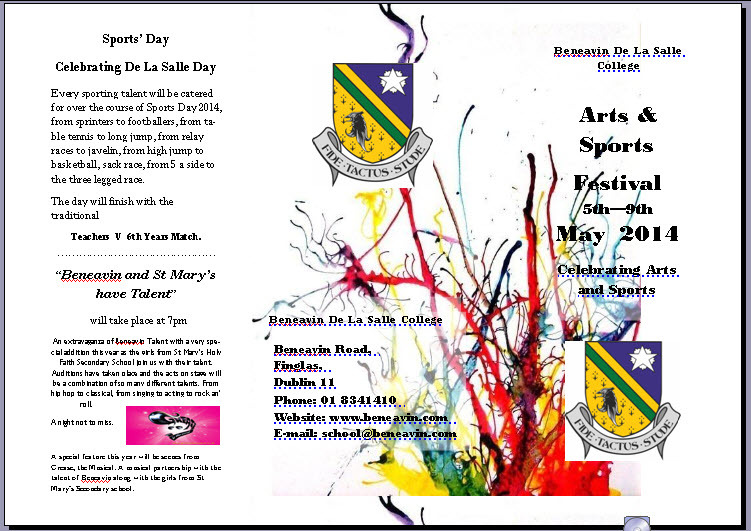 Thanks to all the teachers and SNAs who organized the week and who got the students involved in drama, role plays, Farrier displays, quizzes art, music etc etc…..Thanks to Ms Dempsey who played such a pivotal role in organising the week. The students managed to get a great taste of the arts from most first years experiencing the art animation and Origami workshops with Pat and James from the Finglas Arts Squad. The classes who were lucky enough to be part of Noel Monahan’s Poetry Reading were delighted. The students enjoyed hearing Rob Curley, Graphic Novel Author’s presentation and we have identified a number of serious comic buffs as a result. Ger and Linco’s rap seminar was a great success as were the foot tapping Music Workshops with the Ní Mhaolagain’s. Dermot Bolger was tremendous with the 5th years with some budding writers emerging. Over the weekend Dermot wrote a letter to one about his writing. The students loved the storyteller Philip Byrne and it was amazing how engaged the students got with the Hip Hop classes. The manager of Beneavin Lodge made a point of coming over to comment on how wonderful the Traditional Band were entertaining the residents of the Lodge hoping that they will make it a regular event. Thanks to Mr Fox and Mr O’Neill for the photography outing with the DeValera class and wonderful photography exhibition and to mr O’Neill for taking the photographs over the course of the whole week. The Battle of the Somme reenactments with the history students went down a treat and thanks to Ms Dempsey, Val Duffy and Mr Fox and James from the Finglas Art Squad for making it such a success along with the support of all the history teachers particularly Mr Kelly from the IT side. The display from Liam Gleeson’s grandfather brought a very special dimension to the whole experience. Well done to Mr Hanratty for organising the sunshine for Friday and making the Sports Day work out so well. Thanks to the whole staff who worked with Mr Hanratty to make the sports day go so well and to Ms Togher for the fundraising fun element. Thanks to Mr Walsh and Mr Nash for the sports day hike. We won’t gloat about the tremendous win for the teachers over the 6th Years – or maybe we will……. Well done to Mr Monahan and Mr Corcoran for the tremendous success of Friday Night’s Beneavin and St Mary’s have talent. The months of hard work that went into every detail paid off in a most professional presentation of students’ talents. Thanks to them for ensuring the musical talent of our students has not only been identified but nurtured and developed to a point where they could stand proud on any stage. The talent that we all witnessed on Friday night was inspiring. They were all winners. Such a pity to only pick one out!! Congratulations to Dean Bradshaw as overall winner. Thanks to all who helped make the night such a huge success -Thanks to Ms Creighton for such a wonderful job on the wardrobe – for sourcing the outfits to ensuring each and every student felt great on stage. Thanks to Mr Kelly for a superb job of MC over the course of the night. Thanks to Derek O’Donohue who directed Grease to the highest of standards with the support of Mr Monahan and Mr Corcoran. It was great to have St Mary’s involved and their talent really enhanced our night. We hope that we will continue this link next year. Thanks to Jim Cowan for putting up the stage and preparing the school for the event with the help of John Smith and Thanks to Mr Doherty , floor manager making sure everything went like clock work. Thanks to mr Murphy for such a professionally produced programme. Thanks to front of house Mr Sweetman, Mr Hanratty , Ms O’Brien – thanks to Ms Dempsey for organizing the raffle as well as taking the photographs for the night and to Ms Dempsey, Ms Baird and Mr Poole for working along with the other teachers who sold tickets. Thanks to Ms Baird and Ms Gibbons who organised the shop. Thanks to Ms Ni Mhaolagáin for helping with wardrobe and thanks to Mrs McArlean, Nancy Owens, her daughter and Janet Kelly with Aine McClean for make up. Thanks to Laura who organized the prizes and presentations on the night along with the background administration for the whole event. Thanks to all of the other teacher who helped out on the night – their presence and help was much appreciated. Thanks to all of the staff who supported and worked with the week to make it such a success – every single member of staff made this week.